When the 39-year-old patient presented to the hospital in Fort Bragg, CA, the emergency room (ER) doctor diagnosed “status epilepticus” and had already treated him with haloperidol and diazepam by the time he had spoken with the sole neurologist on staff. Peter Glusker, MD, who had been in neurology practice for 32 years, was en route to a meeting out of town, so he recommended transfer to a tertiary center for formal neurologic evaluation and management, including MRI and EEG, as neither was immediately available at his hospital. Instead, the ER called the telemedicine/robotics company that the hospital had been using for about a year, and its doctor, working over 100 miles away, overrode Dr. Glusker's advice — as well as that of the admitting hospitalist that day, and the one on duty the next day — stating that he could manage the patient remotely. But is it better for the patient? Dr. Glusker doesn't think so. Technological advances like telemedicine are literally infatuating, he said, but he noted that the tools are only as good as the doctors using them — both with regard to their knowledge of medicine and the strengths and weaknesses of the technology itself. Two days following admission, Dr. Glusker transferred the patient to the University of California-San Francisco, where an MRI revealed a basilar artery infarct and by then, they had a locked-in patient. After the patient was transferred back to Dr. Glusker's hospital, the family decided to stop supportive care. Dr. Glusker, who was initially supportive of the technology when it was introduced at his hospital last fall, said his concerns extend beyond quality of care. He was stunned when, just a few days ago, the mobile robot held a one-hour rounds session on one of his patients who was recovering from a hemiplegic migraine — with the telemedicine doctor and several other clients watching. Permission for this second opinion had not been requested, and there had been no informed consent obtained from the patient, Dr. Glusker reported. The telemedicine doctor [at the remote location], a pulmonologist by training, arrived at a different diagnosis — a peripheral cranial neuropathy involving one side of her face and the contralateral arm [sic], Dr. Glusker said. Written consent, per se, is not the point, said Dr. Bernat; what's essential is that physicians ensure that patients understand what is happening, what to expect, and why it is being done. “If time is an issue (as it usually is), this information could be provided in writing in advance, but the physician should then be sure to ask the patient whether it's okay to proceed or if there are still any questions,” he explained. Granade is less concerned about the medico-legal risks for care provided remotely to emergency patients in underserved areas. However, she noted, if anything goes wrong when telemedicine is used for elective cases, especially when expertise is available in-house, a legal argument could be easily made for a breach in the standard of care. “In those cases, not only could patients sue in the state in which they were hospitalized, but [also] if it's a state with a cap on damages, there's nothing to keep a patient from suing in the state where the telemedicine company is located, if that's more favorable,” she added. The technology, originally adopted to address the need to act quickly to care for stroke patients in remote locations, has been received enthusiastically by stroke specialists. Vascular neurologist David Chiu, MD, associate professor of clinical neurology at Weill Cornell Medical College, has served as the director of the Methodist Hospital Eddy Scurlock Stroke Center in Houston, TX, since 1997. The Center uses the In Touch Remote Presence robot for performing stroke telemedicine evaluations at Memorial Lufkin hospital, a large hospital in east Texas, and is considering expanding their stroke telemedicine network. “It allows immediate stroke ‘bedside’ examination, diagnosis, evaluation, and recommendations for treatment at hospitals that are not staffed around-the-clock with vascular neurologists,” said Dr. Chiu. Because of the critical time factor, the greatest benefit is for selecting appropriate patients for thrombolytic treatment, he explained, pointing out that a study comparing telerounds to bedside rounds at Hopkins showed that patients report equally excellent satisfaction with the robot encounter as they do with standard care. But some neurologists who've seen the robot in action are not so enthusiastic. Danny F. Watson, MD, has been practicing neurology at Bloomfield Hills, MI, for the past 17 years, and is on the staff at St. Joseph Mercy Oakland Hospital staff in Pontiac, which acts as the “hub” for 30 rural hospital “spokes” throughout the state that form the Michigan Stroke Network. He has occasionally consulted on patients after the acute episode when patients are transferred from one of the underserved hospitals at which robots are used. “There are some patients who are badly frightened by the robot,” Dr. Watson said, explaining that the experience can be traumatic for already confused patients. Although he acknowledges that when there are no neurologists otherwise available telemedicine can be of occasional help, he pointed out that at his well-staffed hospital, a lone robot, once all the rage, was put to pasture when its operator-neurologist left over a year ago, and has not been used since. Waning interest has left more than one robot gathering dust in the closet, neurologists report. So, not surprisingly, High Point, NC, neurologist, J. Keith Miller MD, asked himself — “Is it a marketing gimmick, or truly intended to improve patient care?” — when administrators at two of his four hospitals mentioned that were investigating the use of robots for general neurologic care. He suspects that the hospital system is engaging in a technology race with the competing university system and wants to show that it, too, has cutting-edge tools. “But with plenty of neurologists on staff who live close to the hospitals, I can't help but question if the goal is to show that they have services that are slick, new and happening,” he said. As a member of a seven-person neurology group, he is also concerned about the consequential loss of revenue to his practice, and wonders if management has fully considered the political ramifications of such a decision. In spite of increasing unease by some physicians, and mounting ethical, legal and regulatory concerns, telemedicine shows no signs of slowing down. On May 26, the Centers for Medicare & Medicaid Services published a proposed rule giving hospitals more flexibility in credentialing and privileging telemedicine physicians. The interactive telemedicine business has been growing by almost 10 percent annually, to more than $500 million in revenue in North America this year, and the use of robots is expanding in some hospitals. Four robots are currently being used at Sinai Hospital in Baltimore to receive physicians' medication orders and load them into drawers built into their systems, while Forth Valley Royal Hospital in Scotland has just introduced a fleet of robots to carry clinical waste, deliver food, clean the operating theatre, and dispense drugs. 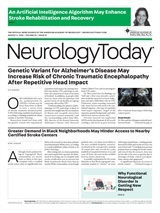 Neurology Today10(16):1, 13, 16, August 19, 2010.